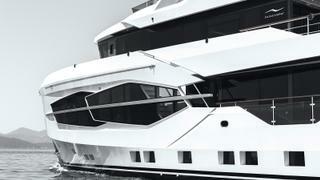 Simplicity of use, engaging styling and the seamless integration of systems — when Omer Malaz, the owner of Numarine, briefed his team to conceive a new 32 metre explorer, these were the guiding philosophies he set down. Take one guess who his inspiration was. And, just like an Apple product that you expect to work out of the box, the yard’s first ever explorer took on a 600 mile passage (with a full complement of guests) just 10 days after delivery. Malaz hopes that Marla, hull No 1 of the Numarine 32XP series, is just the first of a breed of steel-hulled explorers that will dramatically expand the Turkish shipyard’s offering beyond the planing and semi-displacement composite performance yachts for which it’s best known. Smaller and larger XP models are available, but it’s the Numarine 32XP, at 32.5 metres, that has captured a quick market — two more have already been sold. 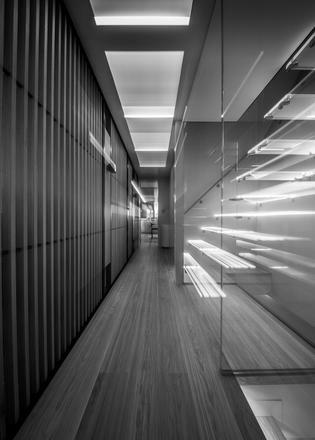 Large internal volumes and quiet cruising were the goal and Malaz’s team obliged with a yacht of just under 300 gross tonnes with 330 square metres of living space, accommodation for 12 guests and ample room for the stowage of matching luggage. Assured of remote troubleshooting from the yard should anything go wrong, the yacht’s systems are so easy to understand that the captain has opted to run Marla without an engineer. “Aspects of the engineering are made obvious, for example the fuel transfer system, so I am confident in using them myself,” says Del Mastro. Marla’s exterior certainly displays distinct and engaging styling. 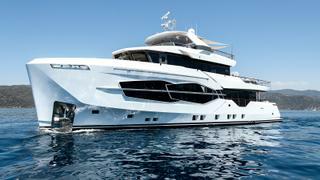 When viewed from the water, she provokes comparisons with a trawler yacht — hardy and stout. 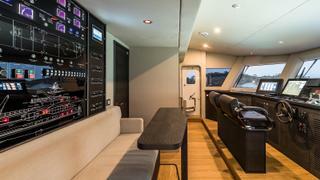 Her superyacht wheelhouse, with its inverted raked windscreen, is perched above the deck like a turret, protected by high bulwarks. 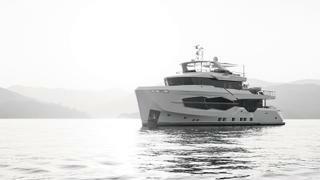 “In creating the new XP explorer series we tried to evolve the design language of previous Numarine yachts into a more robust, muscular and angular design,” says the Istanbul-based designer Can Yalman, who was responsible for Marla’s exterior look. The hull was designed by Numarine’s long-standing collaborator, naval architect Umberto Tagliavini, and promises a top speed of 14 knots, a cruising speed of 12 knots and a 3,000 nautical mile range at nine knots. Given his background in semi-displacement fibreglass boats it’s not surprising that Marla’s captain found her handling slightly heavy to begin with. Yet she encountered the patches of rough weather on her initial Aegean cruise with ease and for the next yacht in the series the shipyard will remedy any manoeuvrability issues with stern thrusters. It’s clearly worked: the owner says he can sleep well and is unaware when Marla is under way. To put that into perspective: 22 decibels is not exceeded in any guest area on the lower deck at anchor with the generator running. If you add air conditioning, it’s still below 35db and when cruising the level inside doesn’t climb beyond 45db — only 5db louder than an average library. Her explorer credentials are underscored by the size of main support boat she can carry; in Marla’s case, a nine metre Technohull RIB. Malaz’s personal experience on the water was an influence on this decision as he recalls guests going ashore in six metre tenders getting blasted by water whipped up from the local meltemi winds. “A large nine metre tender gives an owner so much more freedom to explore,” he says. And that’s exactly what the owner and his family were after, as evidenced by their enthusiasm on the shakedown cruise. Their favourite cruising grounds are the Aegean coast of Turkey and the Greek Islands, although her owner says that for 2018 they will be heading to the Adriatic and further into the Mediterranean. Simple, modern and stylish, the interior is punctuated with some design pieces that reveal an eye for current trends. Designer Esra Kazmirci described the priorities as being “functionality, quality, timelessness and a balance of colour and light”. The owner had requested a relaxing environment with plenty of natural materials, which are apparent in the tactile, veined quality of the marble from the owner’s own quarry, the occasional woven basket and in the wood. The brushed oak floorboards have an exaggerated grain that is noticeable under bare feet. 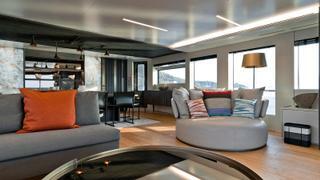 The main saloon provides 48 square metres of living space. Comfortable low seating in neutral fawn colours is brought to life with splashes of colour from Missoni Home cushions. 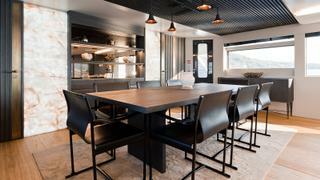 Further forward the tones darken, with the black wood of the dining table and Mirto chairs by B&B Italia, a reinvention of the classic director’s chair featuring dark brown leather and black painted aluminium. In the slated wood panel overhead is the striking Light Forest fitting by Danish company &Tradition. It crawls across the ceiling, ending in drips of copper-skinned lampshades that represent flowers. Elsewhere other pieces, such as the Hexx table lamp by Diesel with Foscarini and Tom Dixon’s Base floor light in brass, reveal Kazmirci’s appetite for future design classics. Brass tones are dotted all over, such as in the door handles, and the colour resonates with the bronze tinted mirrors. The master cabin towards the bow might at first be mistaken for the owner’s suite. It’s a full-beam, generously proportioned space decorated in a dominant palette of greys, laced with thin seams of copper above the low leather-clad headboard. Here, and throughout Marla, pearlescent textured wall coatings in muted violet have been provided by Clarke & Clarke. 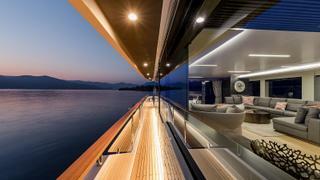 Taking the floating glass superyacht staircase down a flight, you come to the main accommodation area. In perfect symmetry are two twin cabins and two doubles. On the upper deck is the wheelhouse and the large, secluded owner’s cabin. The walkaround bed enjoys views from glazing on three sides, the headboard providing easy access controls for lighting, blinds, temperature and music control. Marla does not want for sociable outdoor spaces, with her 60 square metre flybridge with sunpads, fully fitted superyacht bar, secondary helm station and dining table for 12. On the main deck, another large dining table sits in shade but further aft are more sunpads and to the bow is generous, sun-drenched seating. 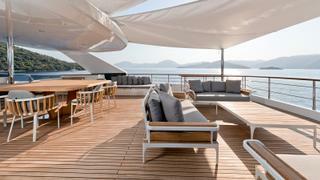 The superyacht beach club added substantially to the yacht’s allure for her owner. 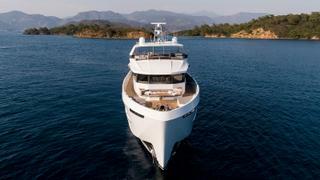 “It’s a fantastic feeling to be on a 32 metre yacht and be able to get just 20 centimetres higher than sea level. I look forward to spending plenty of time there,” he says. 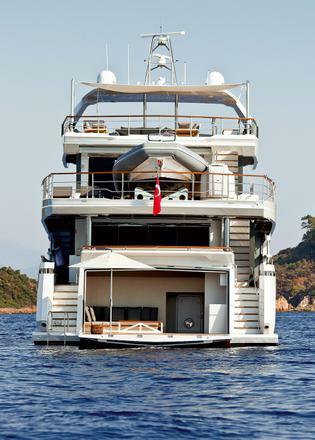 An extremely sociable individual, he imagines at some point clearing the tenders from the 55 square metre aft deck to create a dance floor — with music controlled by iPad, naturally.